Over 300 years of tradition has come to an end as members of the Royal Welch Fusiliers have joined the newly merged regiment The Royal Welsh. 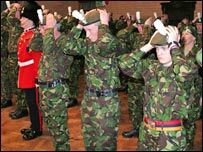 At a parade at Hightown Barracks in Wrexham, fusiliers removed their old berets and were presented with their new head dress. They are joining forces with the Royal Regiment of Wales - each becoming battalions in The Royal Welsh. The UK Government announced the mergers in 2004 as part of army modernisation. The Ministry of Defence said the changes would improve flexibility as the army faced up to 21st Century challenges. The Welsh Guards are unaffected by the move. The Royal Welch Fusiliers were first raised in Ludlow in Shropshire in 1689 and have been involved in every major campaign fought by the British Army since then. 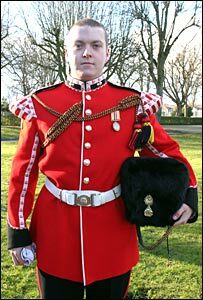 Fusilier Elgan Jones, from Rhos, who was awarded a medal for service in Iraq, said he had mixed feelings about the change. "I think the streamlining is a good thing - it's what we need to do. But it's still sad to see the traditions and identities go". The Mayor of Wrexham, Cllr Mike Edwards, inspected the parade before awarding medals for service in Iraq to a number of officers and fusiliers. Sgt Major Sean Hough said: "We move on - but it is emotional. We will keep some of our traditions and the south will keep some of theirs. It will be a blend of both to keep it fair". The new regiment will be formally be known as 1st Battalion The Royal Welsh (The Royal Welch Fusiliers) and 2nd Battalion The Royal Welsh (The Royal Regiment of Wales). Hightown Barracks in Wrexham has been regarded as the home base of the Royal Welch Fusiliers for decades. 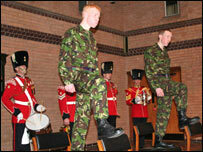 In 2009, the 1st Battalion will move to a permanent home at Dale Barracks in Chester. In a concession, fusiliers were recently told they could keep the title rather than changing to private. They are also being allowed to retain their black "flashes" worn on the collar - a unique right granted by William IV. After Wednesday's ceremony, the two youngest members of the regiment, Fusiliers Robert Steadman and Gareth Bellringer "Ate the Leek" in a St David's Day tradition. Standing on chairs, the two fusiliers munched the raw leeks before washing them down with pints of ale from a silver cup, with a toast in Welsh to the patron saint.